Harper Seven Beckham's style was a topic of conversation before she was even born. Now, that's not because people are weird (okay, maybe they are a little), but because of who her parents are. With two of the best dressed celebrities—David and Victoria Beckham—as your folks, not to mention your mum being one of the biggest designers around right now, fashion is in going to be in your blood. While it pains us to admit it, at just 7 years old, Harper has a better wardrobe than any of ours. It's not surprising, really, considering she made her front-row debut 2013 when she was two and was sat next to former Vogue editor Alexandra Shulman. So what's her closet made up of? From Chloé dresses to chic pieces of knitwear that work incredibly well with a pair of Gucci boots, we just know that you'll get quite a bit of dressing inspo from her. Keep scrolling if you're keen to see the style tips you can glean from HB. Style Notes: VB has been known to use palm tree prints with her own designs. Style Notes: We would wear this pink frilly bikini too if it came in our size. Style Notes: Harper is a girl after our own hearts—she's into the whole clashing colours thing right now, pairing red with pink. Style Notes: Want to look chic in winter? Go the all-black-outfit route, and pair a red coat over the top. Sorted. Style Notes: For starters, David Beckham makes a pretty great fashion accessory (he does dress impeccably, after all). But failing that, even at a young age, you can wear a chic Burberry dress on the front row of the iconic brand's fashion show. Style Notes: Military jackets are always a safe bet when it comes to stylish outwear, as Mama Beckham clearly knows. Style Notes: Harper has already learnt a trick from her mother—chic, neutral knitwear is a must. As with VB, Harper goes for a grey frilled-sleeve number we'd really like to track down for ourselves. Style Notes: No outfit is complete without a decent pair of boots and an It bag, right? Right. Here, Harper goes for the double whammy of flat Gucci boots and a Goyard mini tote. The dream. Style Notes: Harper's wardrobe is full of pretty dresses (many of which are from Chloé). It's cute and refreshing that she dresses like an actual kid here. 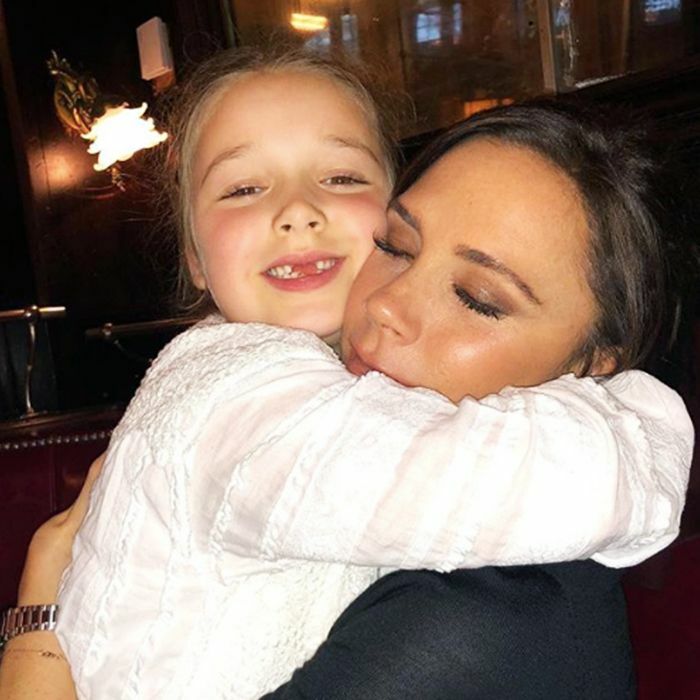 If you have a daughter or need to buy a present for someone who has one, take inspiration from Harper Beckham and shop the below goodies. We want these stat. Do they come in bigger sizes? This cardigan is super cu5e.